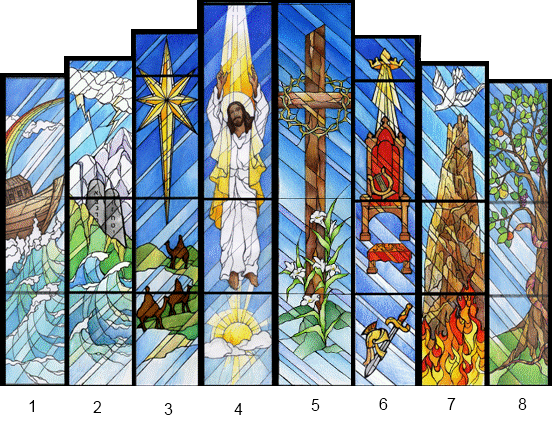 The stained glass windows at Messiah Lutheran Church not only memorialize many individuals, but also enhance the worhip of present and future generations of the people of this Church with the beauty and grace of color and light, communicating the truths of God and His Gospel through the symbols, and leading us nearer to God in understanding and in service. The stained glass windows were dedicated on September 23rd, 2012 at the 10:30 am Worship Service by Rev. R. Burk Hill. 8-A Creation (Genesis 1-3): God created all perfectly and placed man to walk with Him in the Garden of Eden with but one prohibition – not to eat the fruit of the Tree of the Knowledge of Good and Evil. Satan, in the form of the serpent, sowed the seed of doubt and arrogance, and Adam and Eve ate the forbidden fruit, bringing sin and death to them and all mankind. But before expulsion from the garden, God promised them a perfect seed of woman, a Savior from sin and death. 1-A Flood (Genesis 5-9): Mankind grew in number and in rebellion against God, who chose to wash it all away and start over with the only family yet to love Him, Noah’s. On the ark this family was delivered from death and received the rainbow promise of God not to destroy the world by flood again. 7-A Tower of Babel (Genesis 11): Mankind again grew in pride and arrogance, attempting to become equal with God, built a tower up to Him and walk in His garden. God stopped their foolishness by giving them confusion of tongues, preventing them from completing great city and tower, scattering them into all the world as He had commanded them in the first place. 2-A Exodus: God chose a people through which to show love to all peaoples. Moses led the descendants of Abraham, Isaac and Jacob out of slavery in Egypt to the Promised Land. God delivered the people through the water and, from His holy mountain, gave them His instruction for living as His people among the peoples. 6-A Kingdom: Shunning God’s sole rule of the people, they desired to be more like the other peoples who had kings. God reluctantly gave them Saul, David and Solomon. These ruled over them and led God’s people in battle against the peoples. The kings expressed God’s gifts in psalms and wisdom, but put both the people and the peoples under their feet as a footstool. 3-A Savior Born: The Star is born! Immanuel, God with us. The fulfillment of the Garden prophecy: a Light to the peoples, and the glory of His people. Wise men of the peoples from the east come to honor Him, the perfect Prophet, Priest, and King. 5-A Savior Died and Rose: Jesus complete His mission to save the peoples from sin, death, and the power of the Devil by His suffering, death, and burial. On the third day He rises from the dead and insures life for all in Him. 4 Savior Ascended: The Light of the world commissioned His Disciples to go into all the world with the message of salvation through Jesus – The Way, The Truth, and The Life – until He returns in glory at the end of time, as they saw Him depart into Heaven. 5-B Lift High the Cross: Until His return on the Last Day, we continue His work as Prophet, Priest and King, by sharing His message of repentance and life eternal. 3-B Worship Him: As the wise men came from afar to honor the newborn King, those with the wisdom of God go afar with the light of His Gospel, that all the peoples may worship the eternal King of kings. 6-B Judge: Jesus, the King of kings, now sites in judgement, “until I make your enemies you footstool” (Acts 2:35 ESV). He sends the Church Militant into all the world with “helmet of salvation, and the sword of the Spirit, which is the word of God” (Ephesians 6:17 ESV), rejoicing and singing praises to our King in all situations. 2-B Law and Gospel: God’s Law was filled full by Jesus, now His disciples can, by the indwelling power of the Spirit, live according to His will. The waters of Baptism and the Word of God set His people apart from the world, instruments of His love to all the peoples. 7-B Pentecost: A reversal of Babel, the Holy Spirit fills His disciples to speak to all present in Jerusalem, and listeners heard their words in their native dialects. As His present day Prophets, we preach the Gospel to all the peoples that they may hear of His good news of peace. 1-B Baptism: As the ark carried Noah and his family safely through the flood, Baptism carries God’s people through life to the promise of eternal life in heaven. 8-B Fruits of the Spirit: As we wait for God to make all things new again in accordance with His perfect plan for creation, His children bear the fruits of the Spirit, “love, joy, peace, patience, kindness, goodness, faithfulness, gentleness, and self-control” (Galatians 5:22-23). Go in peace as you serve the Lord!